Comfort and exclusiveness meet in one of the most impressive properties in the area. This four bedroom detached residence boasts exquisite style, a unique location, has been modernised to an exacting standard and is placed centrally on a huge plot with ample off street parking. 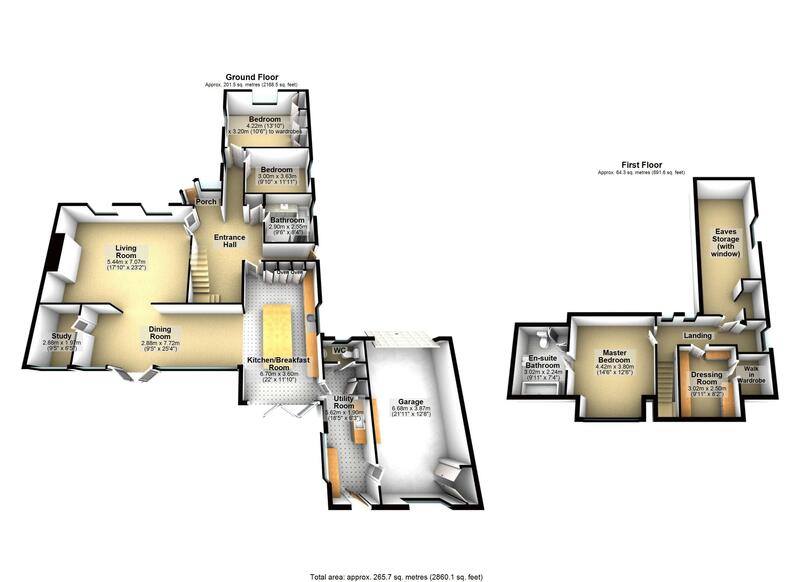 As you enter the property through the stylish entrance vestibule you are greeted by an impressive hallway with a view over the rear garden allowing you a first glimpse of the stunning rear outlook. From there you have access to all ground floor rooms including the light and bright living room, fantastic dining/garden room which is an impressive area giving you that indoor/outdoor feel, study, kitchen/breakfast room which has been re-fitted and tastefully done, useful utility room, two bedrooms and bathroom. 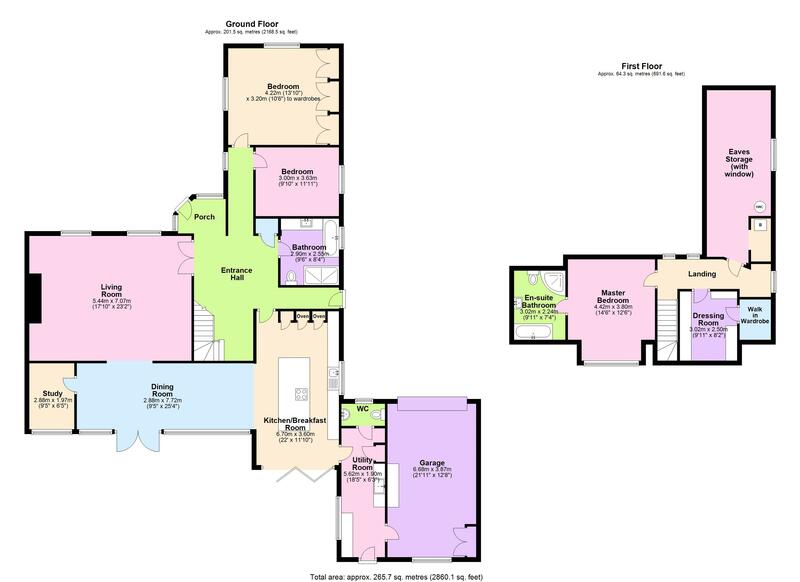 On the first floor you have two further bedrooms and en-suite. 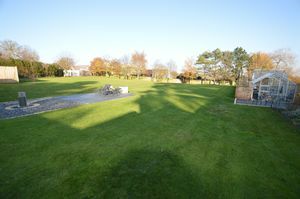 The property is set on a most generously-sized plot in a beautiful and unique setting. 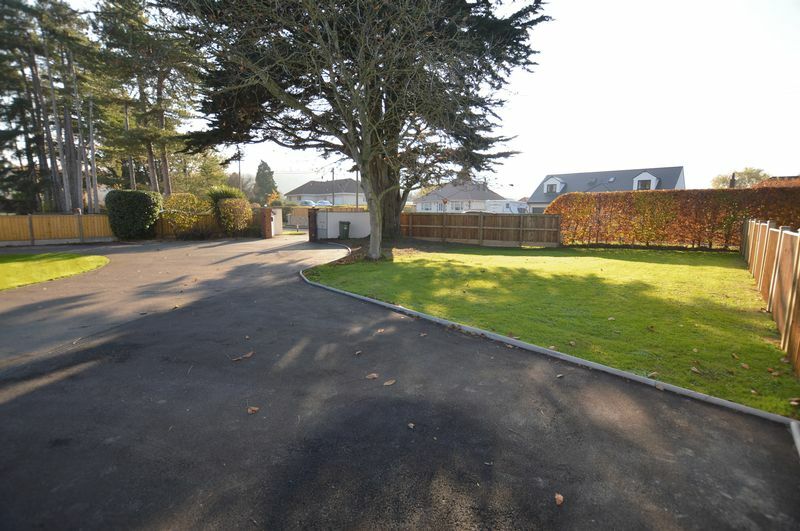 The front offers ample off street parking with mature trees, hedging and borders which soften the approach. 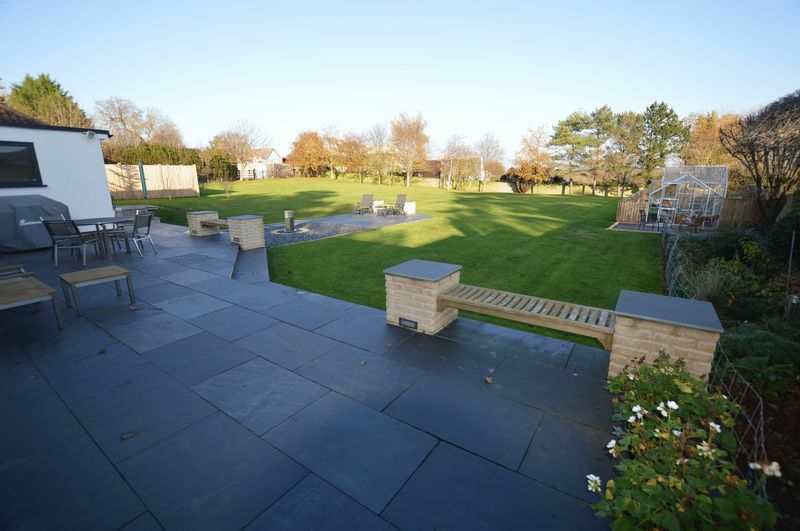 The beautiful rear garden is mainly laid to lawn, patio and growing areas and has an amazing view over historic Banwell and the Mendip Hills. 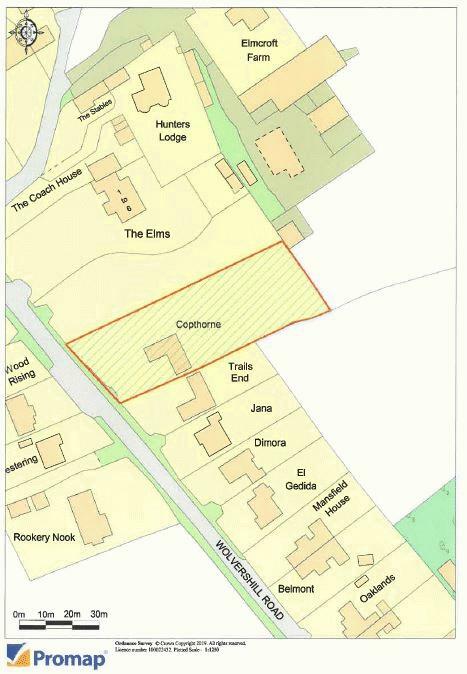 It has perfect areas for entertaining, growing, gardening and of course the added bonus of the outbuilding which has the potential to suit other uses (subject to planning permission and building regulation approval). 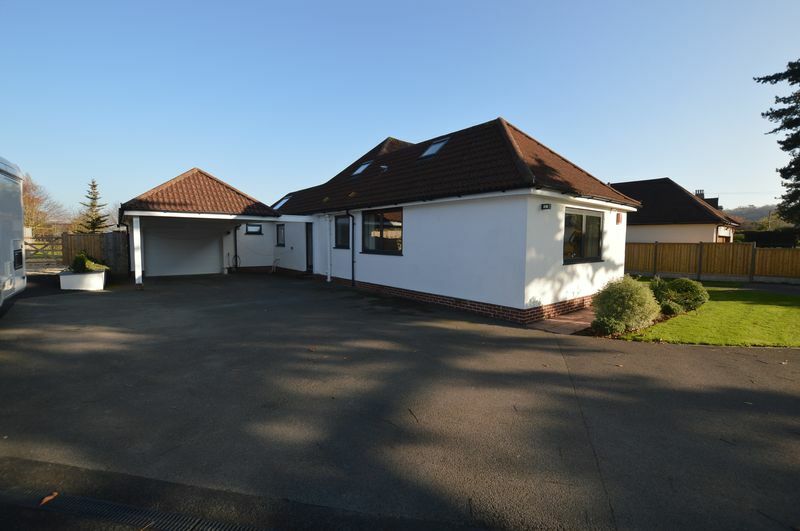 This is a rare opportunity to purchase a superb, individual property and it goes without saying that it’s highly recommended by the agent. EPC rating D66, Council Tax Band F.
An impressive hallway with coved ceilings, three radiators, walk-in cupboard, understairs storage, hardwood flooring, doors to principal ground floor rooms, stair flight rising to first floor, picture fixed window to stunning rear of property. Door to side of property. A super light and bright room with coved ceiling, wall lights, two UPVC double glazed windows to front of property, free standing wood burner set in inglenook fireplace with timber mantle over, two radiators, double doors to hallway and opening to Dining/Garden Room. Wow! 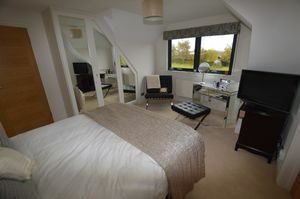 What a room overlooking the spectacular garden and views. Coved ceiling with inset spotlights, double colour-coated aluminium doors plus sliding picture windows offering an amazing indoor/outdoor feel to this area, which can only be described as impressive. 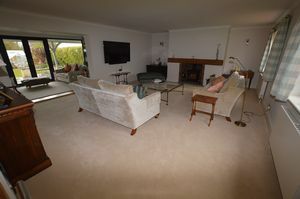 Two radiators plus two electrically operated panel heaters, hardwood flooring, fixed window back to hallway, door to study and opening to kitchen. A delightful room with a great view via its full length colour-coated aluminium double glazed picture window. 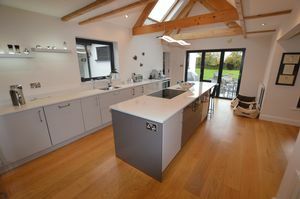 Again refitted and tastefully done, this contemporary kitchen has it all. Vaulted ceiling with exposed roof timbers, two Velux roof light windows, inset ceiling spotlights, UPVC double glazed window to side and aluminium bi-fold doors to rear. An extensive range of storage units with Silestone work surfaces and up-stands over complemented by a configuration of mood and working lighting. 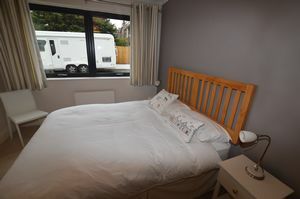 The appliances include integrated wine cooler, Miele dishwasher, Neff fridge freezer, one and a half bowl stainless steel sink with mixer and hot tap over, Neff double ovens and large Neff plate warming drawer. 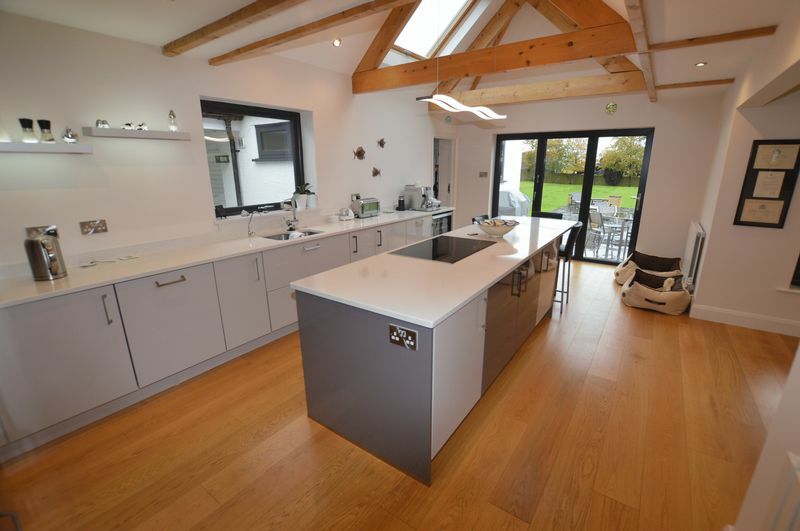 A Bosch five ring induction hob/hot plate is set into a stunning cooking island which also provides a breakfast bar, further work surfaces and storage. Hardwood flooring. Doors lead back to hallway and utility area. 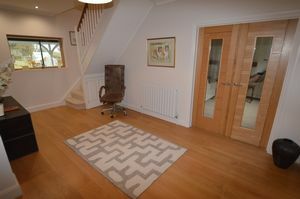 The 'stable' type door leads to this most useful and functional room. Range of wall and floor units with roll edge work surfaces and tiled splashbacks over. Double stainless steel sink with swan neck mixer tap over. 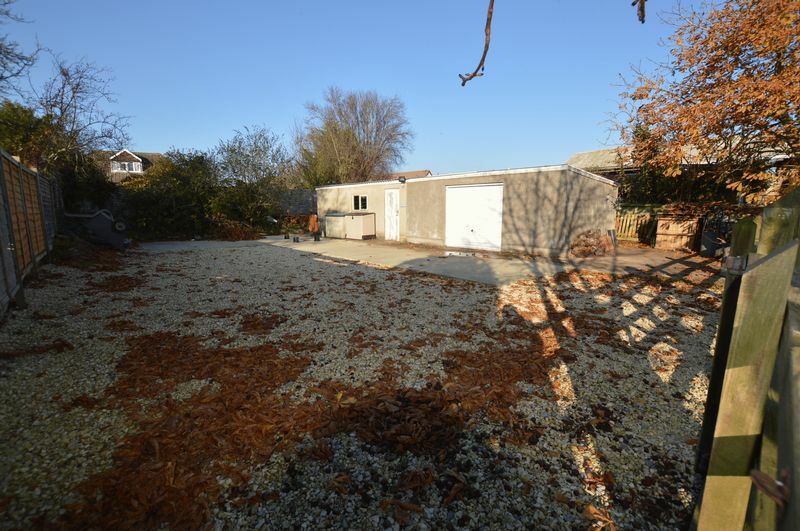 Doors to cloakroom, garage and garden. 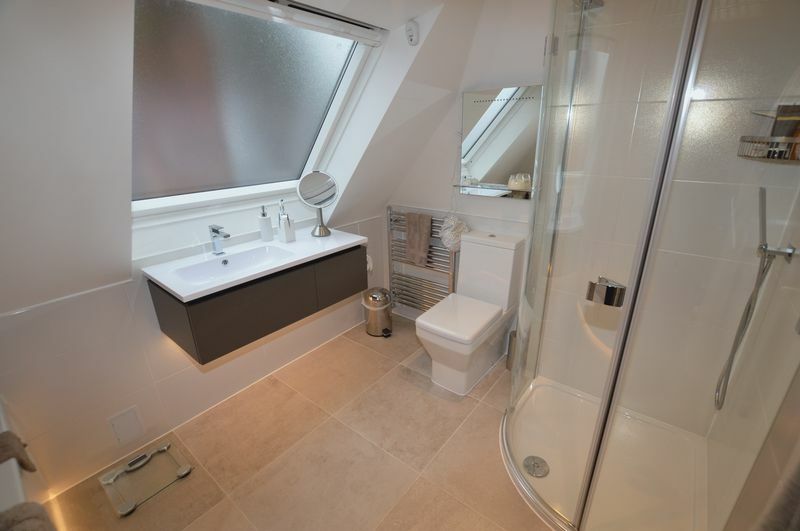 Inset ceiling spotlights, vinyl flooring, space and plumbing for appliance, radiator and UPVC double glazed window. Low level W/C, wash hand basin, radiator, UPVC double glazed window, vinyl flooring, inset ceiling spotlights and extractor fan. 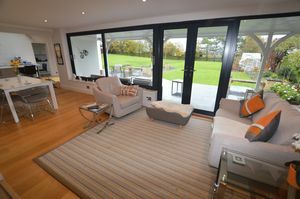 Electrically operated roller door, UPVC double glazed window and door to rear, power and light and plumbing for appliance. 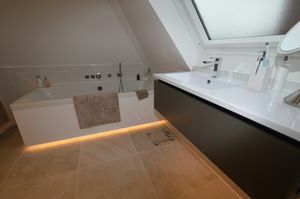 Panel bath with central taps and shower hose attachment. Shaped wash hand basin set in drawer unit with mirror over, heated towel rail, low level W/C, walk-in shower enclosure with drench type mains fed shower and hose attachment over. 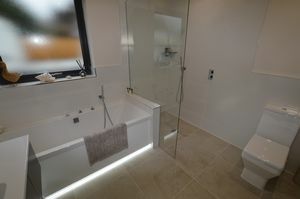 Tiled flooring, part-tiled walls, extractor fan, mood lighting and UPVC double glazed window. 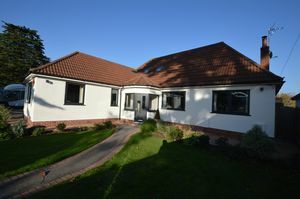 Dual aspect UPVC double glazed windows, coved ceiling, range of built-in wardrobes and radiator. Coved ceiling, UPVC double glazed window, radiator. 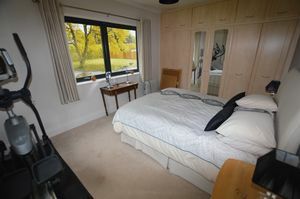 Spacious third bedroom. Stair flight rising to first floor landing from hallway. Three Velux roof light windows, inset ceiling spotlights, doors to first floor rooms, radiator, door to roof space storage area with wall mounted gas fired Worcester boiler and controls, one further Velux roof light window, power and light. 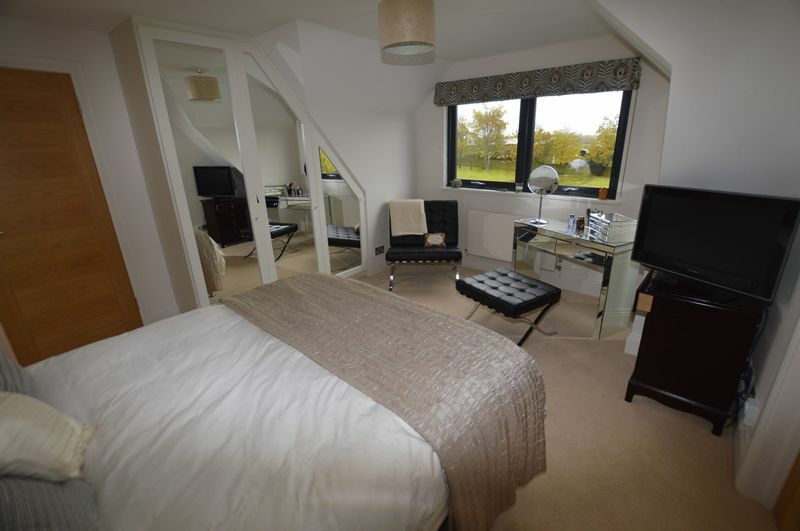 The sloping ceilings give this room a cosy feel whilst the UPVC double glazed window to the rear provides super views over open countryside and hills beyond. 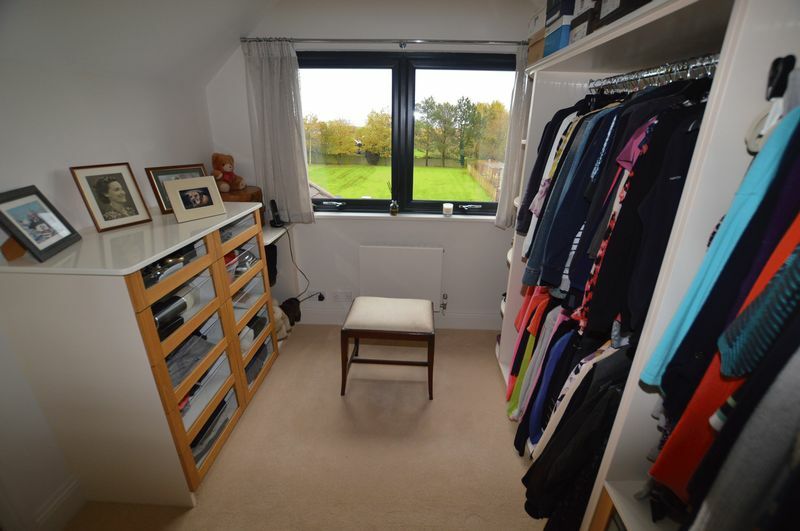 Radiator, built-in wardrobes and door to en-suite. 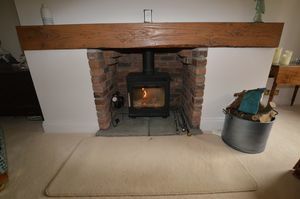 Re-fitted to a high standard. 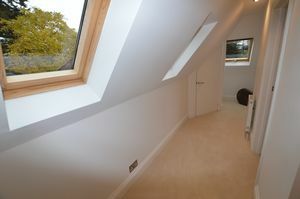 A Velux roof light window set in the sloping ceiling provides ample light. Panel bath with central taps and shower hose attachment, wash hand basin set in drawer unit, low level W/C, corner shower enclosure with drench type mains fed shower and glass doors over. 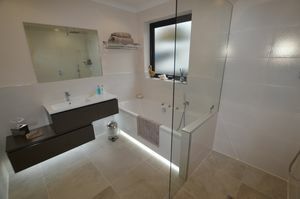 Two heated towel rails, tiled floor and part tiled walls, inset ceiling spotlights and extractor fan. Range of open front wardrobes and drawers, inset spotlight, radiator, UPVC double glazed window with fantastic views and door to walk-in cupboard. This room is currently set up and used as a dressing room. 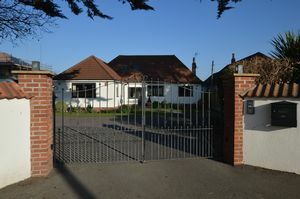 The entrance to the property features wrought iron electronically operated gates with remote access entry system, leading to an extensive area laid mainly to lawn and tarmac providing off street parking for numerous vehicles. Mature trees, hedging and borders soften the approach. 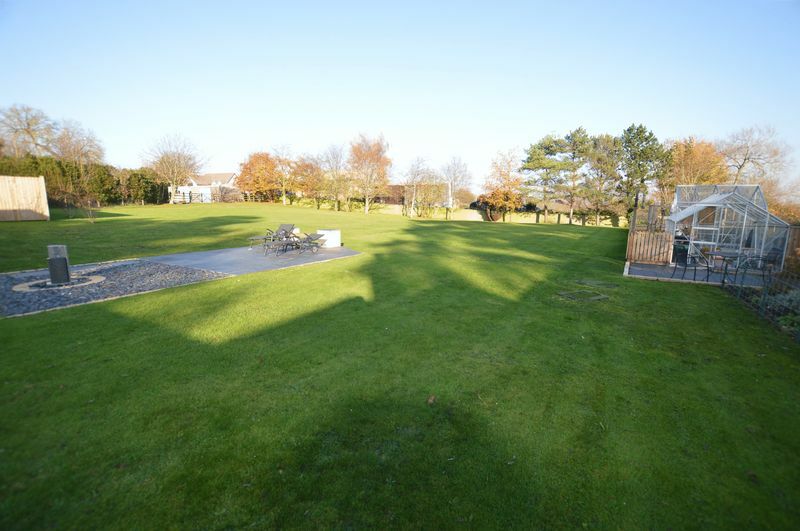 There is access to both sides of the property, including vehicular access to the rear garden via a five-bar gate. Undercroft parking is also a real benefit. The supply of water, power and light is in abundance outside. 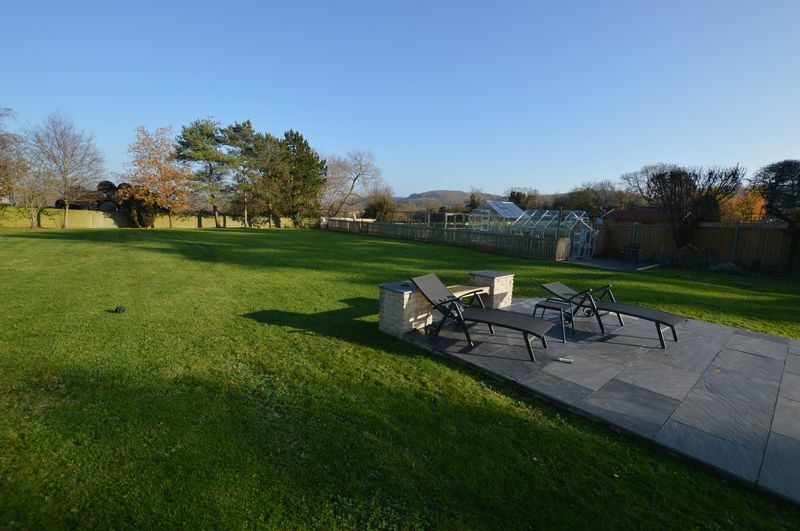 Well … what an expansive area with stunning views over historic Banwell and the Mendip Hills. 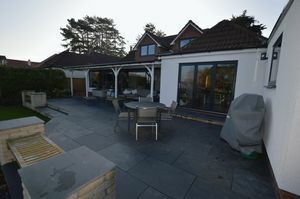 The full width patio with concealed lighting and water feature offers extensive areas for dining and sun-bathing and includes a covered area for lounge seating leading from the garden room. The remainder of the garden is mainly laid to lawn and is perfect for both entertaining and gardening with the added bonus of the outbuilding which could suit alternative uses subject to planning and building regulations approval. 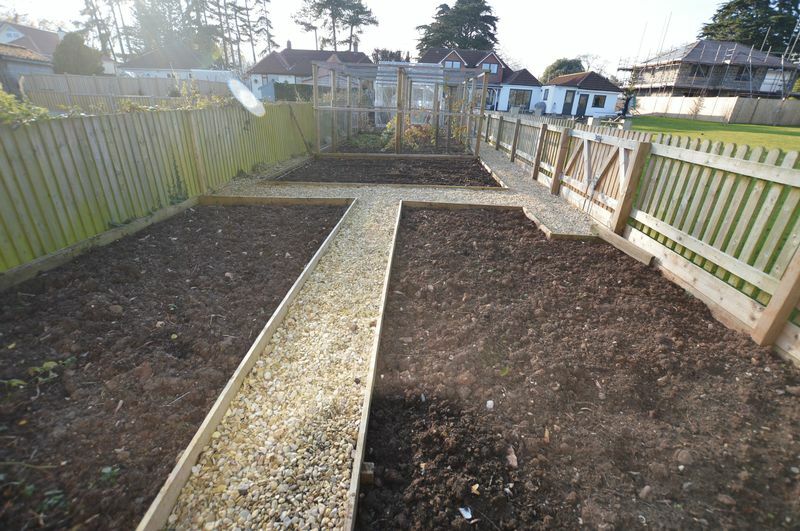 The rear garden is an extensive, well-fenced area surrounded by mature plants, trees and shrubs. 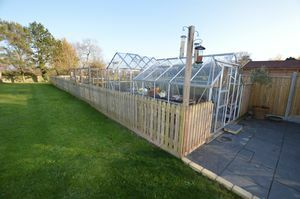 There is also an enclosed garden area with two greenhouses, large fruit cage and raised vegetable patches. Well... what a space! 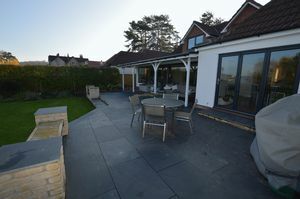 Mainly laid to lawn, patio and growing areas this garden has it all. Perfect for entertaining, growing, gardening and of course the added bonus of the outbuilding which could suit alternative uses subject to planning and building regulations approval. 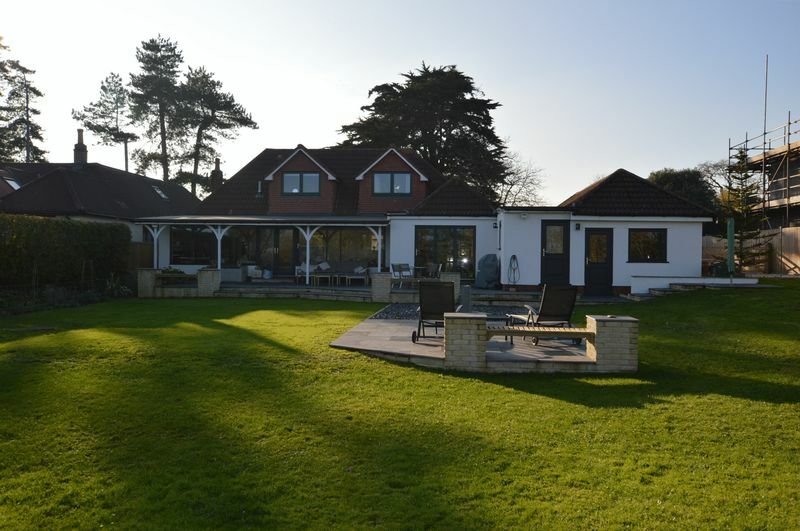 The rear garden is an extensive, enclosed area surrounded by mature plants, trees and shrubs. The enclosed growing area is also a delight. Up and over door, window, pedestrian door, hard standing, power, light and water outside.